Diabetes results in a wide range of serious medical complications with significant implications both for the affected individual and their society. Globally three quarters of diabetes is now in low and middle-income countries who lack the infrastructure to manage the scale of the emerging problem. Diabetes is a major problem in India with 1 in 12 people affected amounting to 69 million individuals currently (more than the entire UK population). With increasing economic development, the numbers are rapidly increasing. The majority of studies on how diabetes develops, how patients respond to medications and the causes of medical complications that arise are from white European ancestry populations despite the fact that diabetes in Europeans is very different to diabetes in South Asians. There is an urgent need for a large in-depth study of the specific causes and consequences of diabetes in LMIC in order to identify different subtypes of diabetes that exist and understand how best to manage each subtype. The project is a 4-year partnership between two institutions, the University of Dundee’s Global Health Research Unit and Dr Mohan’s Speciality Diabetes Centres, who between them command access to two of the most advanced diabetes management systems in the world: the Scottish Clinical Care Information-Diabetes Care (SCI-DC), which provides a sophisticated shared electronic patient record for every individual with type 2 diabetes in Scotland (n=250K) and the Dr Mohan’s Speciality Diabetes Centres (DMDSC)(n=400K). 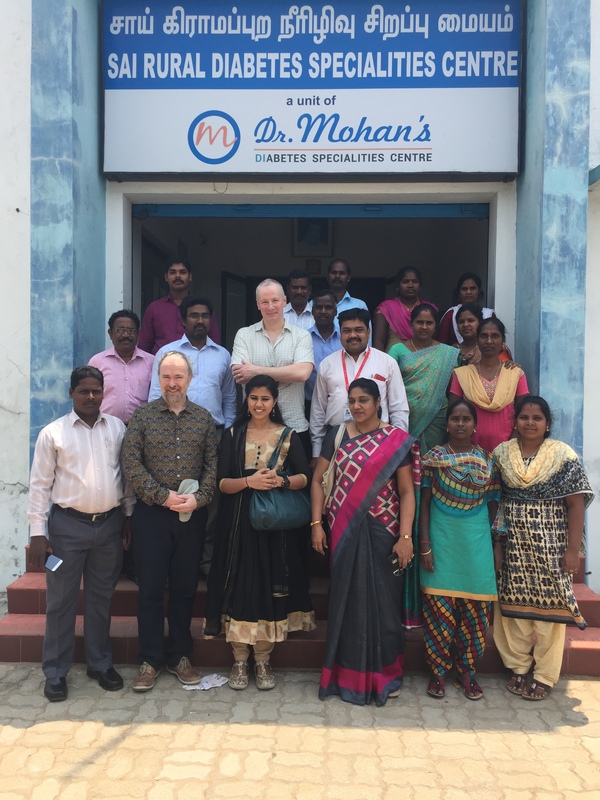 Both clinical systems are partnered with internationally renowned research groups (GoDARTS in the UK and Madras Diabetes Research Foundation (MDRF) in India), who have previously collaborated in international studies of how genes influence susceptibility to type 2 diabetes. 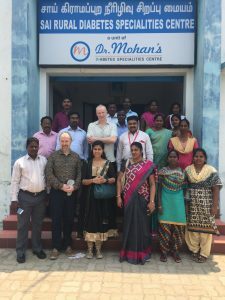 The partnership is focused on using this extensive infrastructure to deliver precision medicine to improve outcomes in patients with diabetes in India. Both groups are studying the molecular and clinical causes of major complications of type 2 diabetes such as heart disease, blindness, kidney failure and amputations. The UK investigators pioneered the concept of personalised medicine through the use of genetics to determine who will and will not respond to commonly used drugs in diabetes. They have also shown that using computers and the internet to summarise and communicate the patient’s medical details to the doctor leads to better health outcomes; and have made substantial inroads in the use of artificial intelligence to analyse digital pictures of patient retinas to find features that reveal a patient’s current disease status. The wide spread adoption of mobile phone technology in India, the development of inexpensive portable retinal cameras that work with mobile phones and the price of large scale genotyping rapidly tumbling to a few Euros per genotyping test, provides the potential to completely rethink strategies for health screening in India. It is ’s ambition to advance knowledge in the field by combining clinical, retinal image and molecular information to build predictive models of complications for personalised diabetes treatment in India. In particular to provide a low cost, agile and sustainable solution supported by telemedicine for outreach to the poorest populations in rural India, the urban slums and potentially other LMIC.